Half pads have become somewhat of a fad lately in the hunter/jumper world, albeit a good fad, but a fad nonetheless. With so many different companies and styles of pads, it can be tough to choose what one is correct for you and your horse. I have compiled a few of my favorite and not so favorite half pads that I have used to compare and contrast. Description: This is a generic, cheap-o foam half pad covered in a white fleece that is about 1″ thick and shaped to the horse’s back. It has moderate compression, but it mostly cushions the saddle on the horse’s back. Washability: Pull out the foam inserts and machine wash the fleece cover. Longevity: Moderate. The foam compresses and becomes dense quickly. My opinion: Eh. I was not a fan. There really wasn’t anything special about this pad and it didn’t do much, it just kind of was a thick layer under my saddle. Suggestion: For someone who needs an inexpensive alternative to a half pad. Find it: Most tack shops carry their own brand. Description: A cotton quilted pad with a sheepskin lining and rolled edges. The sheepskin pulls heat away from the horse and wicks moisture while relieving pressure points and absorbing shock. Washability: This pad can only be hand-washed with MELP and hung to dry. Longevity: Moderate. Because the pad is white, it gets dirty very easy and the sheepskin needs to be refluffed after use. I haven’t had any problems with the sheepskin falling out. Customization: Available without rolled edges. Some brands carry sheepskin pads in colors. My opinion: I used this for about six months before I purchased a memory foam half pad. I liked it, but it wasn’t anything spectacular. I feel like a sheepskin half pad is the classic “hunter half pad” and they definitely cushion the horse’s back, but nothing like a memory foam half pad. Suggestion: For someone who needs slight cushion or lift under their saddle and wants a pretty pad with rolled edges. Find it: Available from SmartPak and other retailers. Description: This a terry cloth type cover over gel padding. The gel compresses and molds to the horse’s back while absorbing shock. Washability: This pad can be spot cleaned with a spray wash.
Longevity: High. I have had this pad forever and it still looks as good as new. My opinion: I used this pad for quite a while on my pony and really liked it. It was thin enough to not interfere with saddle fit but had enough compression to protect her back. I used it as a shock absorbing layer. Suggestion: For someone who needs slight shock absorption with a saddle that fits their horse well and doesn’t want a thick layer between the horse and saddle. Find it: Unfortunately this half pad is no longer available as far as I could find. Description: This is a pad with memory foam inserts and a suede cover. The memory foam helps relieve pressure points and fill any spaces between the saddle and the horse while providing impact protection. The raised v-shape at the front of the pad also relieves pressure on the withers. Shims can also be purchased to add to the pad. Washability: Once the inserts are removed, the cover can be machine washed. Longevity: I have had a few different Ogilvy’s over the past two years and have had no issues with unstitching, fading, or pilling. The cover does get dirty easily as it is suede and shavings, hay, dirt, and hair cling to it. Customization: One of the selling points of this pad is the custom options. You can choose from ten different base colors, over twenty different piping and binding colors, and different monogram options. My opinion: I love that this doesn’t slide down and press on my horse’s withers and the shock absorption is amazing. Suggestion: For anyone with a less than spectacular saddle fit or a horse with a sensitive back that could use some extra cushion and protection. Find it: Available on the Ogilvy Equestrian website and other retailers. Also, check out my review. Description: Sheepskin lining under Mattes stitched quilted cotton with two front and two rear pockets for the twelve supplied shims. The pockets and shims allow for a completely customized and adjustable fit for the horse. Washability: Hand washed with MELP only. Longevity: High. I would say that this is the longest lasting sheepskin half pad I have used and from what I have heard. The sheepskin does need to be refluffed often, but there has been no issue with the sheepskin falling out. Customization: Mattes half pads are fully customizable from colored quilt and sheepskin to fun binding. My opinion: My mom and I used this pad on her shark-fined thoroughbred mare. It worked really well because the shims could be placed behind the withers to fill in the hollow and balance the saddle. Without the shims it becomes a traditional sheepskin pad. Suggestion: For the rider who has a one-sided, hard-to-fit, or developing horse. Or someone who wants a completely custom sheepskin pad. Description: This is a reversible half pad that features a non-slip material on both sides of the pad,an air vent along the spine, and is filled with a hypoallergenic premium high resilience foam inserts that relieve pressure points and absorb impact. Washability: Machine washable without removing any inserts. Longevity: I have only had this pad for about a year using it on a regular basis and have had no problems with any unstitching, flattening, or fading. Customization: You can choose from seven different fun colors for side A and two more conservative colors for side B. My opinion: This is my favorite half pad. 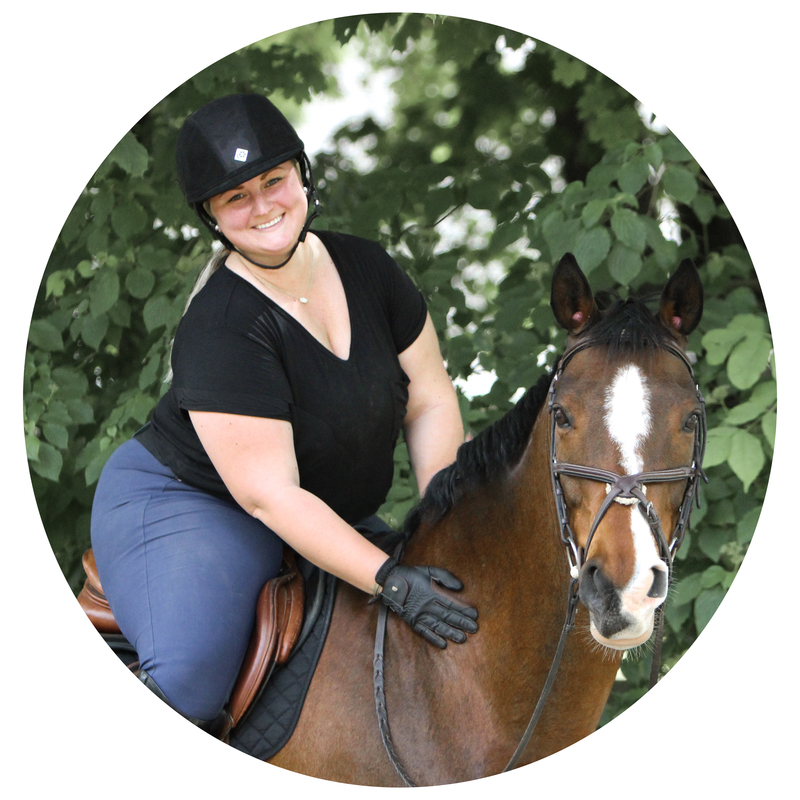 The ECOGOLD made a huge difference in both of my horse’s backs during my rides and the foam helped my saddle sit better on my gelding. The non-slip surface also helped my pads stay in place under my saddle. Suggestion: For someone looking to keep their slippery saddle in place on their horse’s back or someone who wants an “air conditioned” half pad that offers great impact protection. Find it: Available on the ECOGOLD website as well as other retailers. Also, check out my review of the Flip Half Pad. What is your favorite half pad? Let me know in the comments below. Hahaha, I wrote a post similar to this with my half pad progression! I currently use a ThinLine, and it works well for my purposes. I love mine. It definitely rivals my Ogilvy, though it is used for different things. Do you find its as cushiony and thick as the ogilvy? No. It’s not cushiony or pillowy like that all. It is a bit more than an inch thick but it is denser to absorb more impact. I’m going to jump into the Thinline camp as well- love the shock absorption without the bulk! That is exactly what I have heard. Maybe I’ll have to try one out. I keep considering selling one or both of my Ogilvy half pads (I have the regular and the thin version) before they go out of popularity and I can’t get my money back out of them. They just never seem to work for me. Either it’s providing too much bulk in one spot or not enough support in another it seems. I really love the way it feels for my back but if it makes my saddle fit worse then it’s useless. I almost always end up back at a plain mattes pad in the end! I have heard that from some who have a saddle that fits well. I don’t like the idea of a saddle pad that “magically makes your saddle fit perfectly” but I do think they can help cushion an ill-fitting saddle. I love my Thinline Trifecta pad. It’s thin enough to not alter saddle fit, but has the option to have shims added if you need to fix something. I’ve had mine for almost three years now and it’s holding up great. I machine wash it and hang it to dry. You’re number four who told me to try a ThinLine. I guess that is next on the list. I would really like to try the flip pad as I was very happy with my Ecogold dressage pads, but can’t justify the cost when my Thinline works perfectly fine. I am not so sure I buy into the whole memory foam thing, but I sure do like all the color combos they come in! I’m really happy with my Ogilvy, but I still think the Beval Therapeutic half pad is a good match for the high-withered TBs. And based on all the pro-Thinline comments, I might have to give that a shot! I used an ECP pad for a long, long time. I think it’s a great pad, but I didn’t notice any shock-absorption, really. The Gel pads are still around, and you can even get a slightly thicker version from LamiCell. But Ogilvy beats them all, hands down. I love my Ogilvy and won’t ever go back!! nice post. I love my thinline Trifecta half pad. have you heard of it? I have a review in my blog. It’s really good!